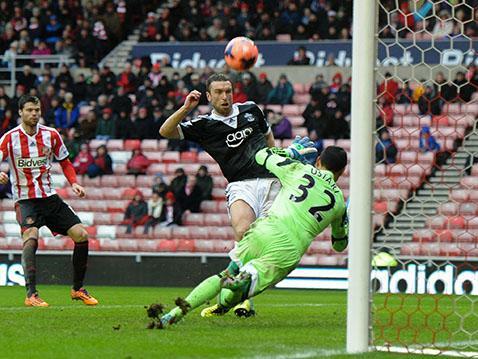 Rickie Lambert contrives to send the ball into orbit from close range. So why is there such a credibility gap between Jesús Pérez’s explanation of the selection criteria for the Cup tie at Sunderland (“it was the best side available”) and what people believe? Well, it’s a long time since Saints fielded their best XI in any cup game, possibly even the JPT final being the last. The moment Jesús took charge of the press conference was when you knew a weakened team was coming, and in the end a huge opportunity was missed. That the home team managed to make nine changes as well is their business – Saints could and should have been stronger. In a pretty abject game, Ward-Prowse didn’t finish with conviction after the only neat build up in the opening period, and then just after the break, Yoshida gave the ball away in midfield: Hooiveld almost rescued the situation, but Wanyama’s failure to land a challenge on Gardner gave his opponent space for the shot with which he settled the tie spectacularly. It shouldn’t have been enough, but Lallana couldn’t get his touch on target when Davis and Clyne combined well, and then with time running out, the same pair produced a far easier chance for Lambert. Actually to say it was easy is an understatement, but Lambert managed to send the ball sailing high over the bar, and that in itself was an achievement given how close in he was. McQueen then appeared for his debut in the last 8 minutes and probably had as many touches as DoPrado had in the first hour, but heads had dropped after the Lambert miss. So who should have played? Boruc, Fonte and Rodriguez would have contributed in crucial positions (Kelvin Davis’s poor distribution seemed to affect all around him), and all except Boruc were on the bench, along with Chambers, Schneiderlin and Cork. Why didn’t they play? Ill or too tired, said Pérez, but not so much so that they couldn’t make the trip. We’re told that it was a long drive back straight after the Hull game, but I’m sure they didn’t have to do that simply because the London Saints contingent had taken all the rooms in the Travel Lodge. In any case, they can now all have a bit of a rest until the end of the season as there’s not much left to play for. And one final question: whatever happened to Southampton’s share of the £200,000 each Premier League club was given to subsidise travelling fans? No answer to this one, not even in a season that saw three trips to Sunderland, and two in a week to the north-eastern sector of the country. LSSC Man of the Match: Steven Davis again. Not at his best but all the others were worse. Become a member of London Saints from as little as £5. © 2016-2019 London Saints Supporters Club. All rights reserved.